Established in early 2017 and led by Tyndale CEO, Gail Whittenberger, our Proud to Help Committee selects local causes near and dear to our employee’s hearts to support throughout the year. 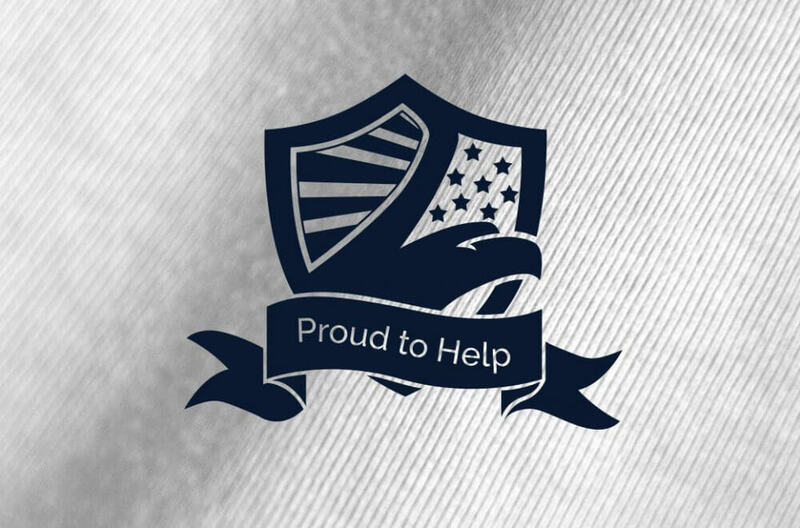 The committee – with help from employees throughout the organization – recently supported Bucks County SPCA, Saint Jude’s Children’s Research Hospital, A Woman’s Place, and Breast Cancer Awareness month. 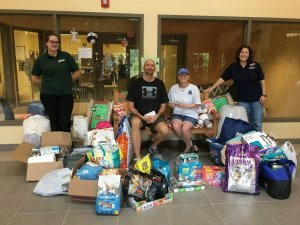 In August, Tyndale’s Proud to Help Committee hosted a donation drive to support animals waiting for their “fur-ever” homes at Bucks County SPCA. With the huge success of this effort, you’d think being an animal lover was a prerequisite for being hired at Tyndale! The generosity of the committee and our employees included several monetary donations and an abundance of necessary items like blankets, towels, food, treats, collars, bowls, toys, and much more! The committee delivered donations to the SPCA – pictured below – who shared any surplus with other local rescues. 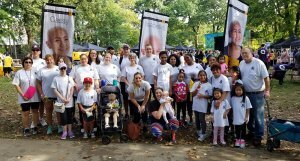 Tyndale’s Proud to Help committee supported Saint Jude’s Children’s Research Hospital by participating in St. Jude Walk/Run to End Childhood Cancer on September 22, 2018 in both Philadelphia, PA and Houston, TX. 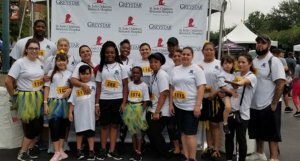 Committee members and employees along with their families and friends from both states – nearly 40 in Pennsylvania and over 50 in Texas – came together to support this cause, raising more than $2,500 for St. Jude’s! As another way to support St. Jude’s, the Proud to Help committee organized the “Battle of the Spare Change,” a friendly competition between our Pennsylvania headquarters and distribution center. Employees from both buildings brought in their spare change (bills, checks, and credit cards were also gladly accepted) and raised over $850 collectively. You may recognize October as Breast Cancer Awareness month, but did you know it’s also National Domestic Violence Awareness month? Tyndale’s Proud to Help Committee and employees showed their support for both causes this October. 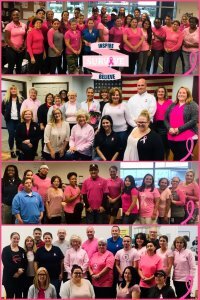 Tyndale employees in Pennsylvania, Texas, and across the country supported those fighting breast cancer by wearing pink or a garment embroidered with our special pink ribbon logo on October 16, 2018. Whenever this special logo is purchased by a Tyndale employee as part of our company uniform program, Tyndale sets aside a monetary contribution for donation to breast cancer research organizations. Tyndale employees proudly posed for photos to express unity and support for all those impacted by breast cancer. Throughout the month of October, Tyndale’s Proud to Help Committee hosted a raffle whereby employees were invited to purchase tickets for items or prize packs ranging from Philadelphia Eagles memorabilia, to laptops, to gift cards – the proceeds of which were donated to A Woman’s Place, a domestic abuse shelter for women and children located in Doylestown, PA. Over $2,000 was raised directly from raffle ticket sales and an additional $500 was added to the donation by Tyndale in support of this worthy cause! For more information on Tyndale’s Proud to Help Committee and to see upcoming initiatives, visit our website.